Within the tech world there has been a huge buzz surrounding the purchase of Oculus Rift by facebook. The price? two billion dollars. So this is great, right? I am sure this success is fantastic for the group behind Oculus Rift. Indeed it seems like the perfect story. Small tech company goes out on a limb and develops something truly new and ground breaking. They get courted by an established company and finally bought. But I want to look at Oculus Rift from the view point of it's initial supporters and how it started. Where it came from what it's values are and how this is in contrast to this big buy out scenario. From here we can then look at why there has been such a big fall out from this purchase. 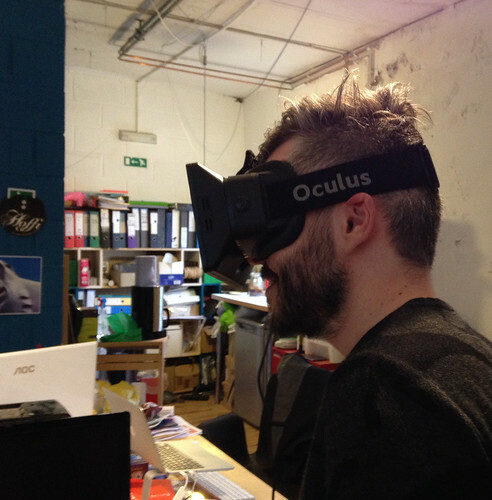 Oculus Rift first came to the attention of most through it's successful kick starter campaign. They were hoping to raise $250,000 to produce a developer kit for people to start making games for the system. The kick starter ended up making well over the target and pulled in a huge $2,437,429. So we have some really interesting values that have already been established through this campaign. By the nature of crowd funding there is an implicit concept that the work is for the small guys to find an audience and then to deliver to that niche market. It's a fertile environment to communicate with your audience (I can think of a few that are slightly different to this Veronica Mars instantly springs to mind but generally) it is about a community working together a collective to help create other peoples visions of the future. So it is not about the big guy telling us what to do and what to watch. It is not about us being tracked, our data collected, interpreted and turned into information to guide the latest marketing strategy. There was also a really strong connection to a particular group within this group. The game makers. These were the people who they were asking to help them create experiences and games for Oculus Rift. These were the people who would make Oculus Rift have content. They will ultimately be the ones who would make Oculus a success. The games industry is broad and wide in terms of offer there are larger established game publishers as well a small indie developers who were the target of Oculus. Many choose to stay independent and seem almost against the larger corporate giants such as Microsoft. So when Oculus introduce the idea of creating indie based games for Oculus. So when a small independent company that has been crowd funded to achieve it's success is bought out by a huge corporation there is always going to be an element of bad feeling. While some kick starter supporters with be glad that they got picked up I am sure many will see this as being at odd's with what they supported. Equally for the indie game designers who felt their work would be reaching new audiences on a meritocratic system to then be told the company has been taken over by facebook then there will also be ill feeling. I also think that there is something in the idea of how you as a company function. The crowd funding approach to me feels like it is for people fighting against the system that hasn't backed them through traditional means. For groups who could not get VC investment due to lack of business proof or the money they need is too low to be of interest. It would be great to understand what other people think about it. Have Oculus sold out it's audience? will facebook make it better? tweet us @brandhoffi and let us know.